Is it okay if I just call it Maple? Dobble is basically a super-charged game of snap where you have to do a little more cognitive gymnastics to spot the matches. 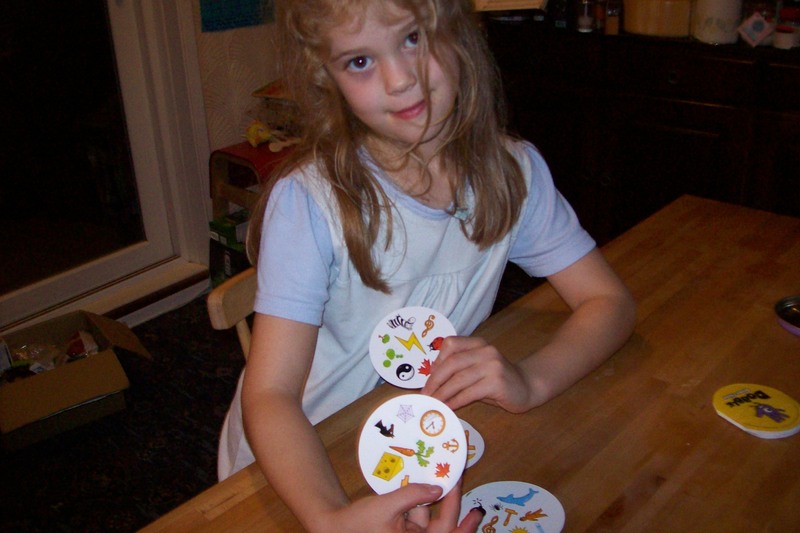 The game comes with a stack of 55 circular cards, each with eight symbols on them, including things like an igloo, a pair of lips, a clover leaf, and a purple cat. What is clever is that if you take any two cards from the deck there will always be exactly one matching symbol between them. 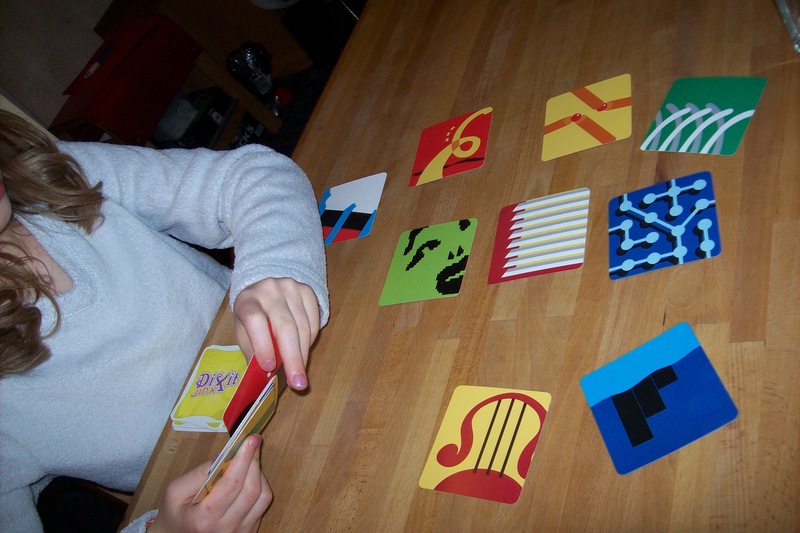 The game comes with five sets of rules to choose from, all of which are variations on trying to spot the matches between cards before your opponents. Given that Dobble is a game played competitively in real time, it’s hard to get a photo of the game in play. So here’s Miss B modelling two cards with matching maple leaves. We came across the game at the UK Games Expo in May, and since then Miss B has been occasionally asking me to get a copy. I’m not sure why it took me so long, but at last we now have our own Dobble set. So far we have had several games using two different sets of rules: The Well (the first person to get rid of a pile of cards wins) and The Towering Inferno (the person to acquire the biggest pile of cards wins) and we’ve had a lot of fun with it. We really must try roping S in on a game some time. So far I have won every game (ending up with my brain hurting a bit), but it’s getting closer and it won’t be long before Miss B gets to beat me fair and square. This is also one of those games that you don’t seem to play one game of. Each game only takes a few minutes, so it is natural to go straight on and play another right away using a different set of rules. The game: Dobble (Asmodee), 2 to 8 players aged 6+. When was antibiotics? Can you give me a clue? I think it’s fair to say that playing a trivia game with a six-year-old is probably not really cricket. You really can’t expect her to know when the first antibiotic was discovered (to be fair, though, I don’t know either), but she requested we played Timeline, so why not? So we have the theory of evolution before the first skyscraper. That’s a freebie for you. This is actually quite a sweet little trivia game. You get a heap of cards with a title (something that was discovered, invented, built, etc.) and an illustration on one side, and on the other it’s the same apart from the addition of a date (the year that thing was discovered, invented, built, etc.). 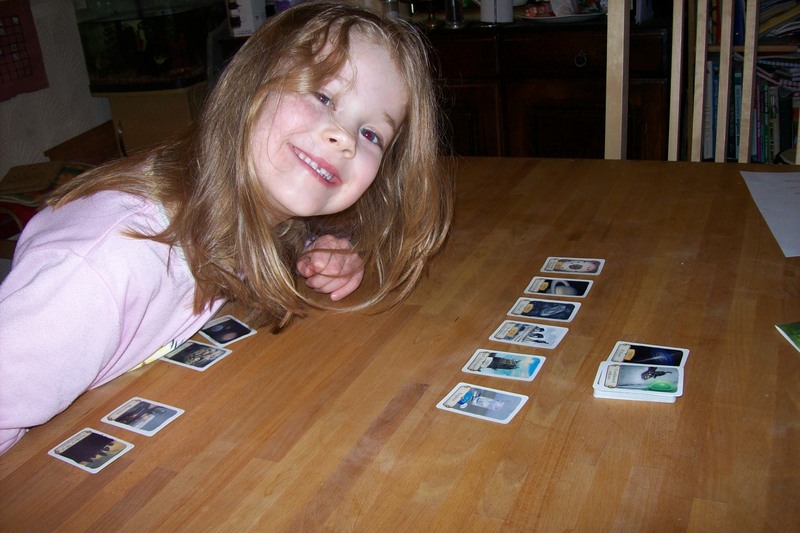 You have a few cards and the aim is to get rid of your cards by taking it in turns to add them to the right position in a growing timeline of cards in the middle of the table, flipping the card to see if you were right. If you are wrong you get another card. With Miss B, we’ve been playing that she gets a couple fewer cards than the adults, and I’ll give her a hint of a couple of places I think the card might go (along with the caveat that I may be completely wrong). Armed with that information, she has demonstrated an unnerving instinct for this game and has won three of the four games we have played so far as a result! I’m astounded that that Timeline has proven so popular with Miss B. I suppose from her point of view it’s a guessing game and we get to talk about the things that crop up on the cards, so it’s interesting from that point of view. 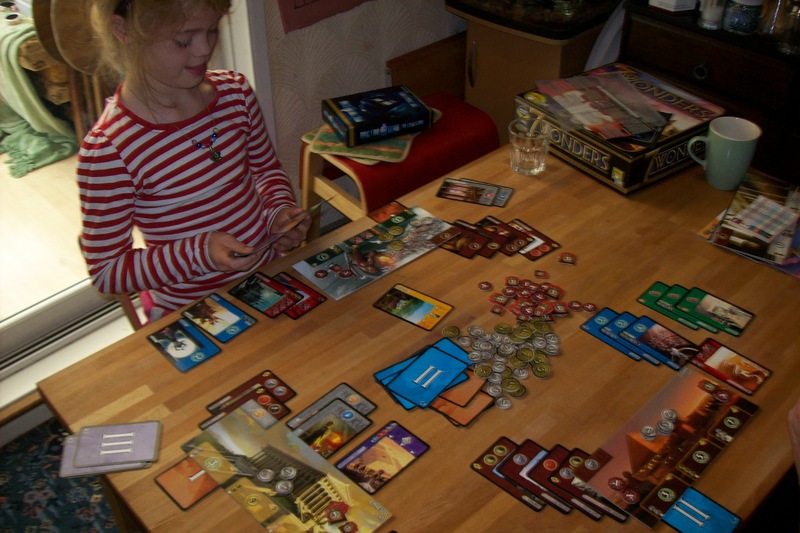 The game: Timeline (Asmodee), 2 to 8 players aged 8+. A few days back we had a lovely day of gaming with friends, with a total of five adults and five kids. The afternoon saw several games get played, including one that I had been wanting to play for some time, Dixit. A can’t remember what the clue was for this lot, but there was a great deal of pondering to do. Dixit is a lovely, visual game that needs at least three people to make it worth playing. The idea is that one person chooses a card from a selection of beautiful illustrations in his or her hand and gives some sort of clue to describe it. The other players choose one of their own cards that, hopefully, could match that clue, and then everyone tries to guess which of the shuffled and revealed cards was the original choice. People who guess correctly get points, as do people who have their card chosen; however, the first player gets nothing if everyone chooses their card. Now, this last point is the key one when playing with many youngsters as at Miss B’s age they can tend to be very literal. Hence we had a point when Miss B had a card with lots of letters of the alphabet on it, so her clue was “alphabet”, which was rather obvious when the cards were revealed. This could get a bit frustrating, but luckily the game is enchanting enough (and relatively quick) that it remained fun throughout. I’m definitely sold on Dixit now. It’s kind of a more visual and more creative version of Apples to Apples, so I’ll definitely be getting hold of a copy for those social gaming moments. There are a couple of variant starter sets available, so I am planning to buy a different version to the one our friends own. 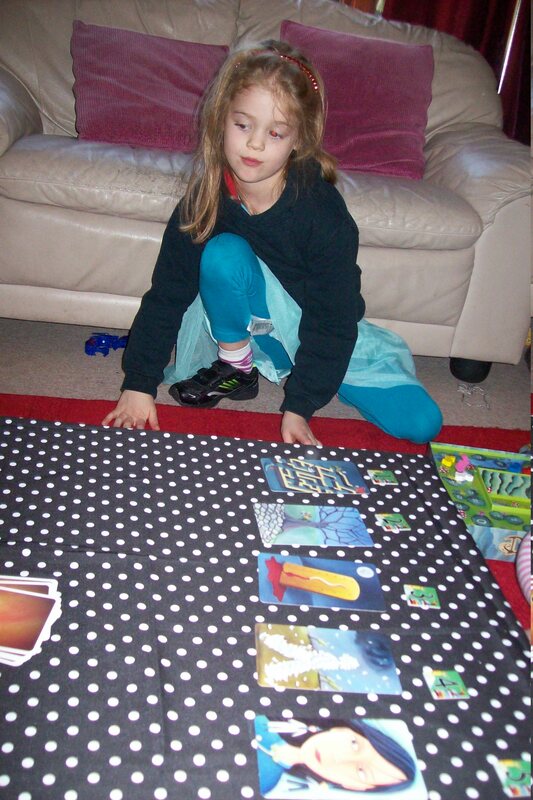 The game: Dixit (Asmodee), 3 to 6 players aged 8+.